Seeking a refreshing outing to have some quality time and fun with your family or friends? Head to Jalavihar on Necklace Road! Jump into pools and enjoy thrilling rides and say no more to summertime sadness. 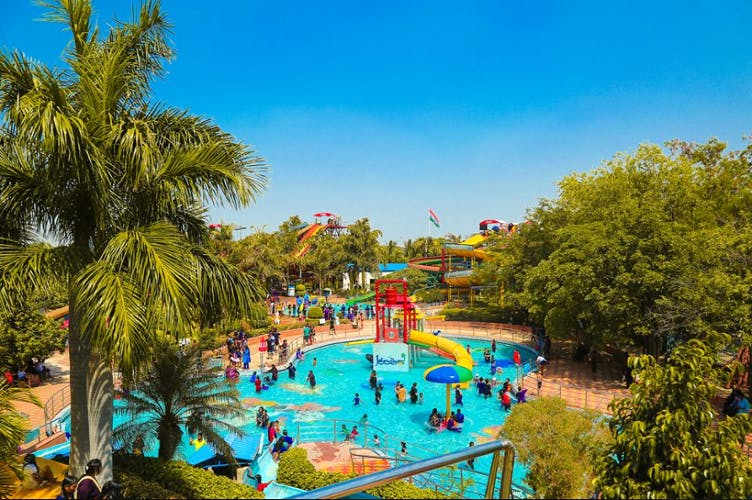 Escape the heat wave by enjoying some refreshing thrills and spills at Jalavihar. From wave pool to children’s play area, pendulum to crazy ride — there is something for everyone here. Kids can enjoy the Kiddie Train, Frog Hopper (a ride that shoots up so you get to savour a view of the city), Bull Ride, Trampoline Bungee Jump, and Bumper Cars. There is also a separate ladies and a kids pool, with 11 interactive activities like a giant Tilt Bucket (that pours a bucket full of water on you at small intervals and still take you by surprise each time), and Mushroom Umbrella. For an adrenaline rush, however, you totally must dare to get on the slides which are the most fun part of this water park. The Pendulum ride is a unique water slide where you glide up and down in a large U shaped slide like a pendulum before coming to a gradual halt, and the Multi-line ride is where you can compete with your friends to make the fastest way down a liquid track into a pool. If you’re someone who lives for twists and turns, you’re gonna love the Twister ride with twists and turns to surprise you. After you play in the pool to your heart’s content, have a ball on the rain dance floor with catchy music. After a long day in the water, you can dry and play cricket with your squad. Perfect picnic plan, isn’t it? The tickets are based on height and cost INR 350 (for 3feet and above) and INR 250 (for children below 3 feet). The swimming costumes are available to rent inside the park, and that’s all we need to spend a day here that we will cherish forever. If you thought Jalavihar is only a place for picnics, you’re so wrong! Because this place doubles as a venue for special events. From weddings, bridal and baby showers to corporate meets, graduation parties and team outings — Jalavihar has hosted it all. Its spacious courtyards and the sheer natural beauty and elegance make it an ideal location for these special occasions, and their experienced staff will help you plan the event from start to finish too. They also have a large function hall and intimate lounge settings. The seating can easily accommodate a crowd of anywhere between 150 to 3,500 guests in different table settings and layouts. They are pretty flexible too in their management and services, so rest assured you can definitely discuss your ideas and have a perfect celebration no matter the event.